I’ve been a parent for over 18 years and an early childhood educator for over 23 years now. In that time I’ve learnt to have a few tricks up my sleeve to ensure the children don’t mutiny on me! They are the little time, money and sanity saving ideas that have helped me to become the parent and educator I am today (well if we are being honest that would be old, tired and just a touch crazy now obviously – no just joking, I’m still sane I promise….just)Those little tips, tricks and ideas that we all have rolled up our sleeves now have a new name MUMMY HACKs …Don’t you love it, makes us sound a little wise and clever I think! DAIRYLEA , the cheese brand that is much loved in the UK is making it’s way to Australian shores and they are celebrating the launch of their new range by asking the Mums of Australia to share their own MUMMY HACK ideas…just like the ones that have helped keep me partially sane as a parent for the last 18 years! 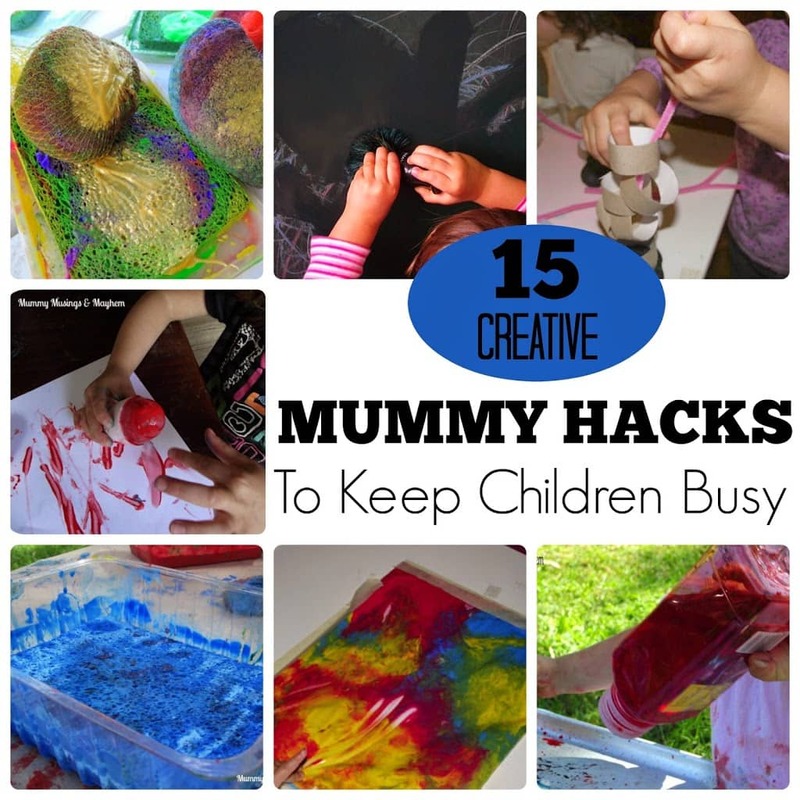 A MUMMY HACK might come from your own experience as a parent juggling the demands of a busy family life or it might be a treasured piece of wisdom passed down from Mum or Grandma! 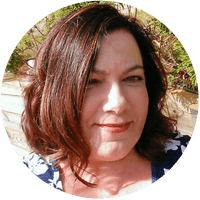 Your MUMMY HACK might just provide some emotional and practical support to another busy ,time poor parent if you share with us all! 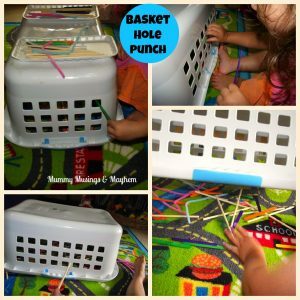 Over the years I have found many ways to save time and money but still keep the kids busy even on the rainiest, temper tantrum filled day and I thought you might like to use a few yourself so here are my top 15 MUMMY HACKS for keeping the kids entertained! 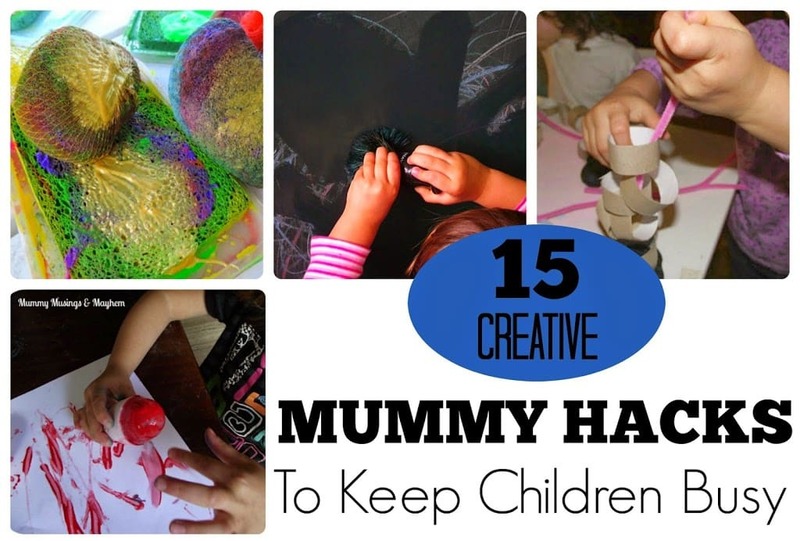 15 Creative and Budget Friendly MUMMY HACKS to keep the Kids Busy! 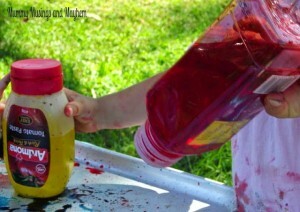 Any dry, out of date ingredients make perfect fillers for a sensory bin. 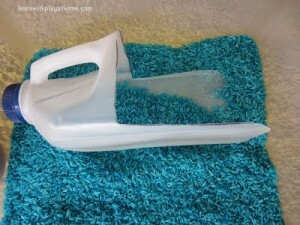 I use one of those under the bed storage containers with a lid, pour rice, beans, lentils or whatever you have that has reached its best before date into the tub, throw in a few plastic cups, spoons and bowls and you now have time for that cuppa in peace as the kids explore. 3. 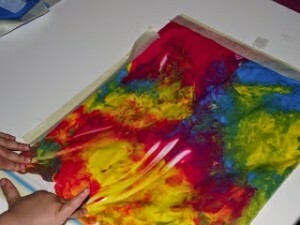 Empty the baking cupboard and use those muffin trays as paint pot holders to keep the spilt paint at bay. 6. 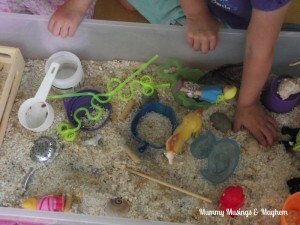 Don’t want to clean up another mess but your toddler is in a creative mood? 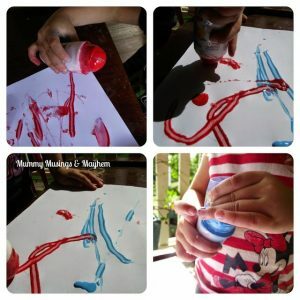 I’ve got you covered with this ‘mess free’ painting activity. 7. 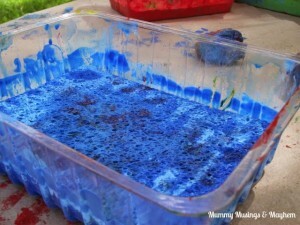 Put a kitchen sponge into a recycled takeaway container to make your very own paint sponge pad – perfect to make sure toddlers don’t use more paint than they need to! 12. 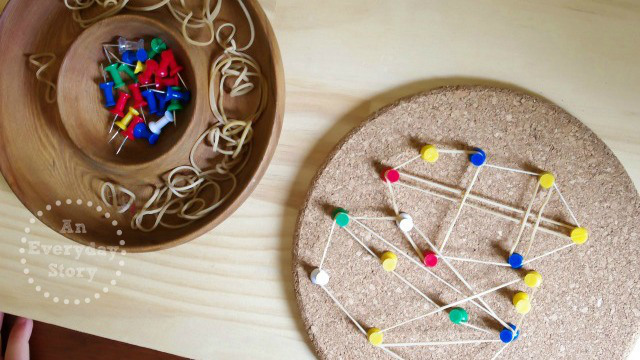 Use a cork pot board, some thumbtacks and a few rubber bands and older children can make their own geoboard like this one over at An Everyday Story. 15. Add a few non slip sticky dots to the bottom of those really annoying little dress up shoes that every child seems to love but cause heartache when you have slippery floors! The DAIRYLEA products are an easy way to get kids eating finger food and save you time on the dreaded lunchbox packing saga at 10 pm on a week night (or is that just me?) I really like that they are free of artificial colours and flavours and the range includes a little bit of fun in its packaging and presentation which we all know can go a long way to getting kids to eat the food we provide! There are Cheesy Pops, Strip Cheese, Fridge Sticks and Cheese Pods. Pods…I love that name for some reason! But I would love a Queensland holiday more and I bet you would too so why not stop by the DAIRYLEA competition website now and share your clever #MUMMYHACK . The best #MUMMYHACKs submitted will also feature on the Facebook page and Website. 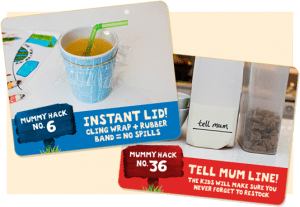 Remember, a MUMMY HACK can be anything that makes life easier or provides some practical help for parents! I can’t wait to read yours….I have 4 your old twins and a teenager…I need all the help I can get! DAIRYLEAand MUMMY HACK are trademarks of Mondelez International group used under licence. 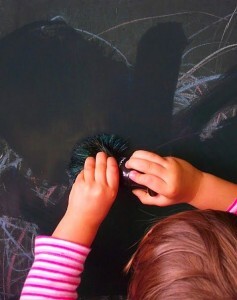 My absolute best, always a winner activity is water, chalk and brushes. The kids love it. They draw and paint for hours. And it’s so simple to set up. 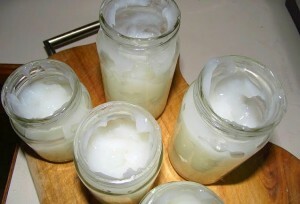 I’ve got a few new ideas to try out from this post too. 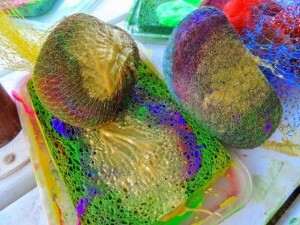 I really like the fruit bag sponges and the sponge in the paint container. These are fantastic ideas! Thanks! And did someone say QLD holiday!!! Popping over there right now. Love all these ideas Jodie. You seriously are so craft creative! Hmm my best Mummy hack? I’m going to have to think on that one! 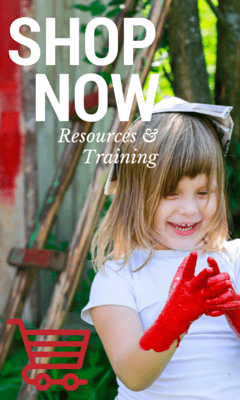 This is a helpful article in keeping kids busy especially on the materials needed which are readily available on household. 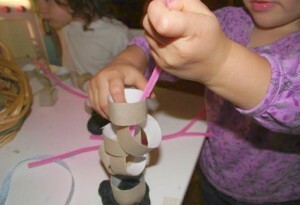 Tips are not just keeping them busy but creative as well.